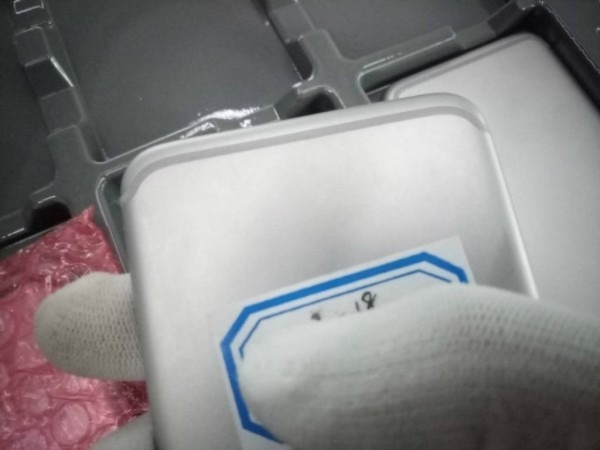 Yet another photo supposedly smuggled out from the Chinese supply chain purports to show a portion of Apple's forthcoming "iPhone 7," this time focusing on the redesigned antenna bands along the device's rear. The shot —which was supposedly leaked by an employee at Apple manufacturing partner Foxconn —seems to show the lower rear of a device that looks somewhat like a next-generation iPhone. An antenna band in the style of the iPhone 6 remains, but is offset slightly toward the edge. A second shell is seen in the background, but there is otherwise very little visual indication of what's actually being shown. The parts bear no identifying marks of any kind. Notably, the design of the antenna band differs from another "leak" seen only yesterday. The newer part features a wavy bend, while the previous piece shows a pronounced U-shaped bend. It's possible that both of these parts represent legitimate prototype devices, but it's equally possible that they are dummies created for sales or attention-seeking purposes. Confusion over this issue is likely to continue until September, when Apple is predicted to officially reveal the next-generation iPhone. To date, most of the "iPhone 7" related leaks have supported rumors that the biggest —and most controversial— change to the device might be the elimination of the 3.5mm headphone jack. It's been said Apple is considering removing the port to allow the device to have an all-new, thinner-than-ever design.